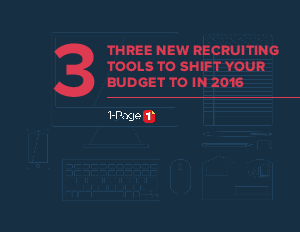 It’s a new year though, so it’s time to take a fresh look at the tools your teams are using. Whether you’re looking at improving your company’s quality of hire or time to hire, or perhaps you’re just looking for a leg up, innovative technology can help. In this e-book, we’ll give you three tools to consider that can help minimize the time spent trying to find the right talent while engaging and managing the relationship proactively.